Tulku Orgyen’s previous incarnation, Togden Kunzang Longdrol, or Togden Sithar, was a great Dzogchen yogi from the Powo region in southern Tibet. Togden practiced under the guidence of many Dzogchen masters from central and southern Tibet, particularly under Lama Gyurga Rinpoche, a main disciple of Dudjom Lingpa. Later becoming a disciple of H.H. Dudjom Rinpoche, Togden was considered a highly accomplished master in the Dudjom Lineage, particularly in the practice of Chöd, which Togden effectively practiced in one hundred and eight significant places (nyansa) in various regions of Tibet. In order to fulfill a prophecy, H.H. Dudjom Rinpoche asked Togden to select one hundred and four suitable Chöd practitioners from among his disciples in upper region of Powo. After their careful selection by Togden, His Holiness gave the complete Chöd instruction to them, and in time, all became excellent masters in this lineage. The Dudjom lineage became the main focus of practice of Togden’s disciples and on his retreat land, Thegchog Osel Choeling, perched upon the spectacular slope of Mount Yuri in the upper region of Powo, Tibet. Aspirations for the Dudjom lineage in Pemaköd began at the time of Dudjom Lingpa, who was one of the greatest Dzogchen masters of the 19th century and the predecessor of H.H. Dudjom Rinpoche. Due to frequent prophecies by Guru Padmasambhava and Khandro Yeshi Tsogyal, Dudjom Lingpa aspired greatly to be in Pemaköd. He told his disciples, “Now, in this degenerate age, go to the sacred land, Pemaköd, those of you who rely on me. Before you young ones get there, I, the old one, will already be there.” Thus, many of Dudjom Lingpa’s students moved into Upper Pemaköd, where H.H. Dudjom Rinpoche was born and where he established the Dudjom lineage, which became a main treasure lineage practiced throughout the Pemaköd region. As a main disciple of H.H. Dudjom Rinpoche, Togden was venerated as the head of Khorlo Dratsang -- the Dharma Wheel Sangha -- one of the two main seats of H.H. Dudjom Rinpoche in Upper Pemakod. In light of the political turmoil in Tibet at the time, His Holiness asked Togden to relocate the center and its sacred objects to the lower region of India-controlled Pemaköd. After fulfilling His Holiness’s request, Togden built the Deden Tashi Choeling temple on his chosen site in lower Pemaköd. He enshrined in this temple the many sacred objects he’d brought with him from upper Pemakod and Powo, including the two stupas which hold the sacred remains of His Holiness’s root teacher, Jurmey Ngedon Wangpo, and his mother Yum Namgyal Dolma, a dakini in human form. Many senior yogins from upper Pemaköd, and Powo, traveled and settled here and spent the balance of their lives around this temple in their own small retreat huts. Upon its completion, many blessings filled the temple and its surroundings. More importantly, Togden rekindled the light of the authentic Dudjom lineage in this new location in order to continue its blessings for generations to come. Among various sadhanas of the Dudjom lineage, one that was exclusively unique to Kharlo Dratsang yogins’ practice manuals in Upper Pema Kod was the Gathering of All Vidyadaras sadhana from the Secret Heart Drop of the Dakinis, a mind treasure that H.H. 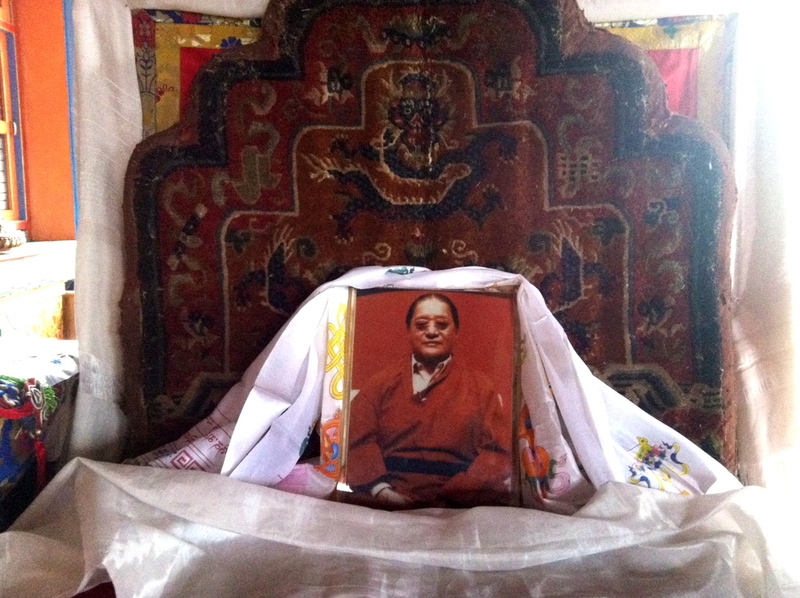 Dudjom Rinpoche discovered at the age of nineteen while he was in Dragsum Kongpo, Southern Tibet. 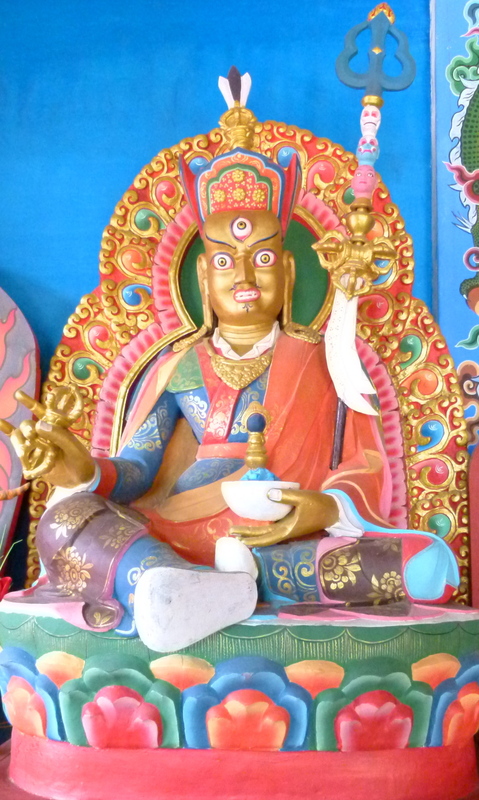 In order to continue the Dudjom Tersar lineage and the tradition of this particular sadhana practice in the newly founded temple, Togden built a Guru Padmasambhava statue inside it, according to the specifications of this sadhana. Since Togden’s time, this sacred sadhana has been practiced on every Guru Rinpoche day, which has been upheld by Tulku Orgyen’s father, Lama Rigzin Phuntsok, a highly respected yogi in this region. Thus Deden Tashi Choeling Temple in lower Pemaköd became the successor seat of Khorlo Dratsang, Dharma Wheel Sangha. This was the fulfillment of Togden’s great aspiration. Tulku Orgyen Phuntsok was recognized when he was one year old as the reincarnation of Tokden Kunzang Longdrol by H.H. Dudjom Rinpoche. As such, he shoulders the responsibility of continuing the Dudjom lineage in this region of Pemaköd. With the Pemaköd Project, Tulku Orgyen has fulfilled the restoration of the retreat land and construction of a new three-storey Zangdokpalri temple, the first of its kind in this region, which enshrines, among other sacred objects, a 16-foot-tall statue of Guru Pamasambhava. Undertaking such work in Pemaköd is the fulfillment of the aspirations of his predecessor as well as those of H.H. Dudjom Rinpoche, who entrusted to Togden with foreseeing confidence, this sacred work to ensure that the blessings of this lineage would continue to shine forth in this region of lower Pemaköd. An additional aspiration of Tulku Orgyen is to fulfill the great aspirations of Dudjom Lingpa, from whose aspiration this precious lineage began in Pemaköd, as well as those of many great masters, including the three Vidyadharas of the Hidden Land, whose enlightened activities in the hidden land awaken multitudes of beings. Indeed, Guru Padmasambhava personally bestowed infinite treasures of blessings upon this region and called it the Hidden Land. These blessings remain a great source of peace and happiness for our world and beyond. It has been prophesied that in this degenerate time, the blessings of the Hidden Land will be crucial for the wellbeing of the entire world. This being so, Tulku Orgyen has renewed Togden’s unwavering commitment to this virtuous work in the Hidden Land for the benefit of all beings. Lama Rigdzin P'huntsok has been the most respected senior lama in the lower Pemaköd region in recent years. He is the grandson of Dzongpon (Governor) Dorje Drakpa of Pemaköd, who was credited with the establishment of many Dharma institutions and was a great provider for the needs of many great masters and genuine practitioners throughout the region, as was his own father Dzongpon Tsewang Rigdzin. Dorje Drakpa in particular pioneered many beneficial activities in lower Pemaköd. Lama Rigdzin P'huntsok is a close student of His Holiness Dudjom Rinpoche, Phulung Sangay Rinpoche, Tokden Kunzang Longdrol, Terton Choeje Lingpa and Tulku Dawa Rinpoche. From these great masters, he received numerous empowerments, transmissions and instructions. Lama is Tulku Orgyen P'huntsok’s father, and serves as Vajra Regent of Tokden Kunzang Longdrol (Tulku Orgyen's previous incarnation) among Tokden’s disciples at Deden Tashi Choeling Temple in Yoldong. As Varja Regent, Lama leads monthly practices as well as other occasional group practices, and presides over public ceremonies at the Temple. Having remained in retreat for most of his life, he gives spiritual guidance to all retreatants on the retreat land as well as to visiting practitioners both from within Pemaköd and from far away. He plays a key role in preserving and transmitting many unique spiritual lineages of the past to present-day practitioners in Pemaköd. Many sincere Dharma practitioners come to seek Lama’s instructions for their spiritual practices, and the general public frequently seeks his guidance and blessings for their day-to-day lives. Relaying the heart advice of his root gurus, Lama has been a great source of inspiration for younger generations to remain in Pemaköd and dedicate their lives to the practice of Dharma. On a daily basis, and with his profound faith and pure motivation, Lama enthusiastically shoulders the responsibility for undertaking and maintaining particular local practices, such as various pujas of Pemaköd protectors and specific aspirational prayers for the preservation of the holy land and for the well-being of its inhabitants. He faithfully keeps in his heart the words of Guru Padmasambhava’s prophecies that every meritorious action taken in Pemaköd affects the rest of the world and beyond, particularly in this time of degeneration. Lama Rigdzin P'huntsok has written many articles, for the most part in the form of spiritual advice for his followers. Some are historical accounts, and others take the form of dohas - spiritual songs of realization. Some of his writings related to Deden Tashi Choeling Temple were compiled in a booklet commemorating the inauguration of the rebuilt Deden Tashi Choeling Temple in 2013, titled "Joyful Feast for the Minds of Fortunate Ones." It is our heartfelt aspiration that Lama Rigdzin P'huntsok live long and fulfill his aspirations for all beings and for the Hidden Land in particular. May it be so! arise the kayas of immortal Vidyadharas. Bestow the blessing flower of auspiciousness here! With the four excellences, you liberate beings. Peerless, supreme being, may you live long. may you guide all beings to the essence of happiness. May the teachings of the Dharma spread out like a summer lake. May the wishes of all beings be fulfilled in accordance with the Buddha Dharma.